Died: 10 August 1865, Mahavelone, Madagascar. William Tyrer Gerrard, naturalist, traveller and plant collector, was educated at Liverpool and at some time travelled through Australia on a botanical tour. He came to Natal from London late in 1860 or early in 1861 as a professional plant collector for the Royal Botanical Gardens at Kew and for Professor W.H. Harvey* of Dublin. He collected plants along the south and north coasts of Natal and inland to Ladysmith, Greytown and Zululand, hampered by recurring attacks of malaria, difficulties of travel, and opposition from the Zulu people. 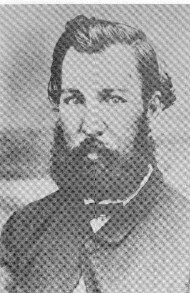 Some of his collecting was done with M.J. McKen* in the Tugela basin and in Zululand during 1862-1865. They collected not only plants, but also birds, insects and shells. Their plant specimens, including many novelties, were acknowledged by Harvey in the prefaces to Volumes 2 and 3 of the Flora Capensis (1862, 1865). Duplicates of their specimens remained in Natal and, with McKen's own collections, later formed the nucleus of the Natal Herbarium (established by John M. Wood* in 1882). Gerrard identified many of his plant specimens himself and sent them to Kew, while those that he had not identified were sent to Harvey. In total he provided them with some 2000 specimens, including new genera and over 150 new species. This was a remarkable achievement considering that C.F. Ecklon*, C.L.P. Zeyher* and others had collected in the colony before him. Two genera, Gerrardina and Gerrardanthus, as well as many species, were named in his honour. Gerrard was particularly attracted to ferns and the locations of some of those he collected were listed by McKen in The ferns of Natal (1869). As co-author with McKen he furthermore participated in writing the pamphlet Synopsis filicum capensium, which was, however, published only in 1870, in Pietermaritzburg. Gerrard soon became a popular figure in the colony, supporting McKen in his efforts to establish a proper botanical garden, and with J. Sanderson* stimulating people's interest in natural history. After sending his last collection to Kew in March 1865 he travelled to Mauritius in April, where the governor, amateur botanist Sir Henry Barkly*, looked after him. In May he went to Madagascar and collected plants on the east coast, north of present Toamasina, but after a few months died from blackwater fever at Foulpointe (now Mahavelone). Botanical News. Journal of Botany, British and Foreign, 1866, Vol. 4, p. 367. Retrieved from http://biodiversitylibrary.org/page/16233429 on 2017-1-12. Harvey, W.H. & Sonder, O.W. Flora Capensis, being a systematic description of the plants of the Cape Colony, Caffraria, and Port Natal (Vol. 2 and 3). Ashford, Kent: Lovell Reeve, 1894 (originally published 1862, 1865). Natal Mercury, 21 August 1869, p. 3, "The late William Tyrer Gerrard". Schrire, B.D. Centenary of the Natal Herbarium. Bothalia, 1983, Vol. 14, pp. 223-236.